Lourdes (Occitan: Lorda) is a town and commune in the southwest of the Hautes-Pyrénées department. It is in the first Pyrenean foothills, in southwestern France. It is overlooked from the south by the Pyrenean peaks of Aneto, Montaigu, and Vignemale (3,298m), while around the town there are three summits reaching up to 1,000 m, which are known as the Béout, the Petit Jer and the Grand Jer. Lourdes was originally a small unremarkable market town lying in the foothills of the Pyrenees. At that time the most prominent feature was the fortified castle which rises up from the centre of the town on a rock. 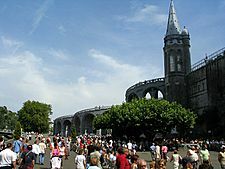 Following the claims that there were apparitions of Our Lady of Lourdes to Bernadette Soubirous in 1858, Lourdes has developed into a major place of Christian pilgrimage. Today Lourdes has a population of around 15,000 inhabitants but is able to take in some 5,000,000 pilgrims and tourists every season. Lourdes has the second greatest number of hotels in France after Paris with about 270 establishments. It is the joint seat of the diocese of Tarbes-et-Lourdes. Lourdes Facts for Kids. Kiddle Encyclopedia.